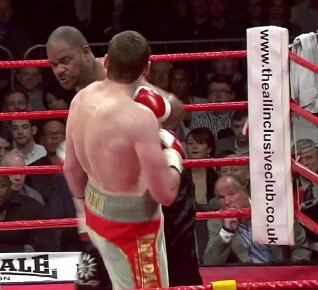 By Scott Gilfoid: 45-year-old former two-time heavyweight world title challenger Tony Thompson (40-7, 27 KOs) is interested in facing #11 WBO contender David Price (21-3, 18 KOs) in a third fight. Thompson already twice knocked out Price three years ago in 2013, and he’s willing to come over to the UK and do it once more. Thompson says that Price, 33, cannot move on until he avenges those two defeats, and he’s willing to give him a chance of doing just that. Price has turned his sagging career around recently with consecutive wins over 2nd tier fighters Ivica Perkovic and Vaclav Pejsar in 2016. Those wins for Price came after he was whipped in two rounds by Erkan Teper last year in July 2015. It’s unclear what happened to the 6’8” Price in his loss to Teper, because he never seemed to get untracked in that fight. Before his loss to Teper, Price had won four straight fights, albeit against lower level journeyman like opponents. Let’s be serious here. There is NO WAY on earth that Price’s promoters at Sauerland Events are going to put him back in with the 6’5” Thompson at this point in his career, even though he can probably beat him at this point in the game. Thompson has lost four of his last six fights in the last three years, and he’s clearly not the same fighter that beat Price in 2013. There’s been slippage for Thompson. He was stopped in the 6th round in his last fight against Luis Ortiz last March in a fight in which he was knocked down three times. Thompson was soundly beaten by Malik Scott in October 2015. Thompson was easily beaten by Carlos Takam by a 12 round unanimous decision in June 2014. Thompson was also easily beaten by Kubrat Pulev by a 12 round unanimous decision in August 2013. Thompson’s last win came against an over of shape Orlanier Solis in February 2015. Solis weighed 271lbs. This is the same Solis that captured a gold medal in the 2004 Olympics for Cuba. Solis weighed 200lbs at the time. He gained a lot of weight after turning pro. I think Price should take the fight with Thompson. If he gets beaten again, then he should retire from boxing. Price is interested in facing IBF heavyweight champion Anthony Joshua. If he wants that fight, then he’s got to prove that he can beat the likes of Thompson. I don’t know why Price wouldn’t want to fight Thompson again, because he needs to avenge those two defeats. While he’s at it, Price should fight Erkan Teper again. That 2nd round knockout loss he suffered against him last year looks bad on his resume. I imagine that Price would feel better about himself if he were to take on Thompson and Teper and beat them. It would be as if the losses had never happened. I don’t think Price will ever fight them again unfortunately. I think Price’s promoters want to put him in a payday fight against Joshua, which I think he’ll lose badly. I guess after that, Price will go back on the journeyman cycle by facing lower level fighters until he gets ranked high enough for another world title shot. Without Price getting a significant win or two under his belt, I do not see him getting a fight against Joshua apart from him becoming his mandatory challenger. I think there would be too much fallout from British boxing fans if Joshua’s promoter Eddie Hearn matched him against Price in a voluntary defense. I think Hearn will want to avoid that from happening. Now if Price can become Joshua’s mandatory challenger, then Hearn can throw his hands up in the air and say that he had no choice but to match Joshua against Price. However, with the awful opposition that Price is facing now, it’s probably going to take him two or three years for him to become Joshua’s mandatory challenger. Price can speed that up if he starts fighting live bodies, but I don’t see him doing that. Price SHOULD avenge his losses to Teper and Thompson for starters. Those are 2nd tier fighters now and no longer contenders. If Price is going to be dining on 2nd tier fighter, then he needs to fight Thompson and Teper again to prove he can beat them. Ideally though, Price needs to fight contenders in the top 15, and I’m not talking about the kind of guys that David Haye has been beating from the contender ranks. I’m talking about talented contenders. If Price can beat contenders, he’ll get pushed up the rankings quickly and get his world title shot against Joshua before he’s 40.